Here is an introduction to one of the principles of design - rhythm - that you can use to make your decor scheme feel more complete and unified. Rhythm allows the viewer to understand the concept, idea or theme of the room and without it the decor may not make much sense. Think about this: imagine a dining room where all the chairs are a different style and some are a different colour too. Maybe every wall is a different colour, or the curtains at one window are made from a dense white fabric, while the curtains at the very next window are sheer purple voile. You wouldn’t know what to make of that room! Okay, I admit that that was an extreme example, but it helps me to illustrate the importance of using the principles of design in your home. Rhythm in interior decorating is achieved mainly through repetition. In order for your decor to flow, you must repeat an element you are using - that element can be colour, shapes, a sequence or group, or a motif. What do I mean by motif? Imagine that you wanted to decorate your room in a nautical style - one model boat isn’t going to bring that look to life; but pair that with striped blue and white fabric, some seashells and maybe a decorative oar or a ship’s wheel and you’ve made your point. By repeating something that is representative of a certain theme or style, you create a pulled-together and defined look - and that is what rhythm is about. 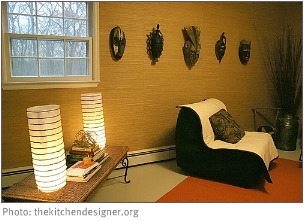 Another way to incorporate rhythm into your decor is to use progression. This is where you increase or decrease the size or detail of objects as you go along. This living room has a distinctive African feel because of the repetition of a motif. The masks, textured walls, woven table and decorative sticks as well as the earthy colours make this style come together because each item is representative of a tribal Africa. 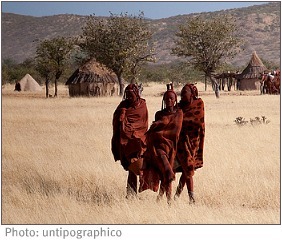 Compare it with this photo of an African tribe - see how the textures and colours chosen for the above living room are representative. In this nursery we have repetition of colour - red, grey and white, as well as repetition of the rectangular shape of the dresser, cupboard, door and crib. Notice that the grouping of cushions has been repeated for both sofas and that the sofa itself is repeated. 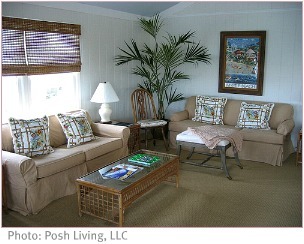 See how this enhances the laid-back beachy feel. A little girl’s bedroom shows us what progression can look like. The circles on the wall graduate from a small to medium and then large size to create a sense of flow. Now that you know about rhythm in interior decorating I hope that you have fun using the principles of design to create cohesion and flow in your home decor.